Epic (2013) – Winning. Words. If The Hobbit: An Unexpected Journey taught us anything, it’s that big adventures can come in small packages. While Epic‘s neat little parcel contains considerably less singing (Beyoncé warbling over the end credits notwithstanding) and considerably more gastropod molluscs (or, y’know, slugs and snails), it aims for similar pint-sized thrills. Fitting, then, that this 3D jaunt is unlikely to win the heart of anyone over three feet tall. Between its assault course of airborne action scenes and over-populated cast of characters (including Chris O’Dowd and Aziz Ansari on comic-relief duty as said snail and slug), it’s surprising that director Chris Wedge (Robots, Ice Age) finds room for any plot at all. It’s there, sparingly, in the misadventures of Mary Katherine aka MK (voiced by Amanda Seyfried), who’s shrunk to a speck by Beyoncé’s green-fingered Queen Tara and then roped into the war between miniature leaf men and forest-trashing Boggans. Before anybody can groan “Honey, I shrunk the kids”, spears fly, swords clash and MK moons over leaf hunk Nod (Josh Hutcherson). Despite a fun zinger late on involving giant electric shocks, few sparks fly between this insipid duo. 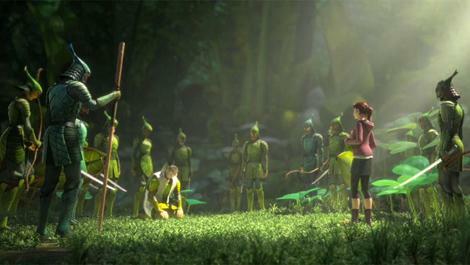 The plot, meanwhile – based on a book by Rise Of The Guardians author William Joyce – seems to have taken narrative cues from the lyrics of Michael Jackson’s ‘Earth Song’. It’s almost a relief, then, that the action’s so relentless, distracting from the writing’s inadequacies with swoopy mid-flight skirmishes. Judicious use of 3D will have the nippers gripping their seat arms throughout. And there’s a bit with a mouse – the size of a bear in this teeny-tiny world – that brings the fear factor necessary to any fairy tale.